Every teacher knows how hard it can be to inspire their students to put work into achieving a difficult goal despite setbacks. Use these motivational quote posters to inspire your students and remind them to remain positive despite setbacks or difficult situations. 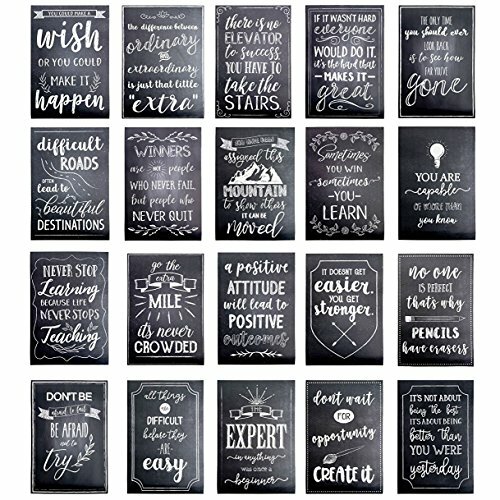 The unique chalkboard design allows you to use them in any type of classroom style and setting, while the variety of quotes allow you to rotate the design to keep the reminders fresh and engaging. INSPIRATIONAL QUOTES: Paste the posters in the classrooms and encourage students to achieve goals. CHALKBOARD DESIGN: The creative design adds a heartwarming touch to any classroom's theme. INSPIRE WITH WALL POSTERS: Teach your students to set goals and not be overwhelmed by difficulties. CLASSROOM DECORATION SUPPLY FOR TEACHERS: Variety pack allows you to choose and rotate quotes! DIMENSIONS: Each poster measures 13 x 19 inches, 200 gsm. GreenBox Art + Culture Donkey, Llama, Goat, Sheep on Teal by Eli Halpin Canvas Wall Art, 36" by 18"
DecorArts - My Bunkie by Charles Schreyvogel; Classic American Art Reproductions; Framed 36"x26"